Casa Kukulcan (House of Kukulcan) is a newly built house that was conceived as a temple to a creator god of the Mayan people. 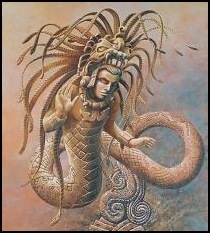 Kukulcan was widely worshipped across the Mesoamerican world. He is a serpent in his natural form, but is also represented by a Caucasian man standing about 6 feet tall with long white hair. He arose from the ocean and was responsible for teaching the Mayan people about civilization, agriculture and medicine. After a period on land, he returned to the ocean, promising to revisit. The Mayan people may have perceived the arrival of Cortez and other Europeans, as the second coming. This feeling may have contributed to the defeat of the Mayan, Aztec and other cultures. 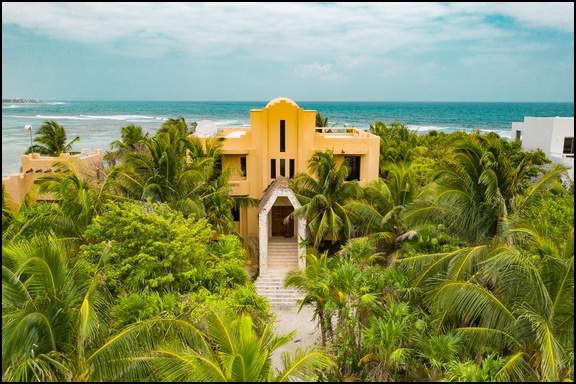 Casa Kukulcan was designed by a famous architect. Central to his design is the inclusion of the mythological portals or gateways of Kukulcan. 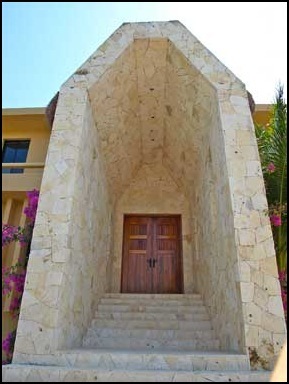 The land portal is made up of ceremonial steps and an immense Mayan arch of over 5000 square feet fitted in hand shaped limestone. 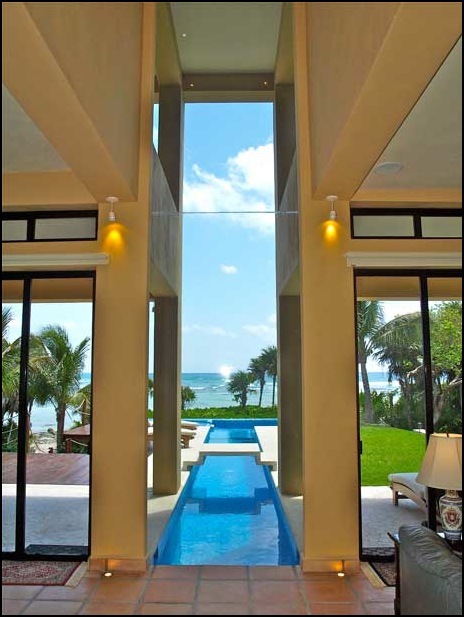 As you move into the house, one passes similar huge processional pillars, then the vista opens to Kukulcan’s ocean portal. 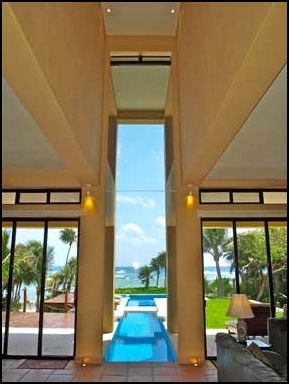 The ocean portal consists of a 20 feet high vaulted ceiling and window. On both sides of the window are dual triple glass doors which fold into the walls to combine inside and outside elements. 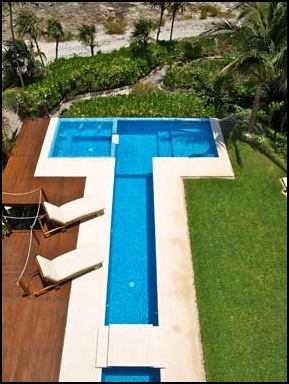 Adjacent to the inside of the house begins the 50 foot long pool which reaches outside past the window towards the ocean. The Caribbean ocean and reef are in the background. The floor plan is designed to seamlessly flow indoor and outdoor living and to create a feeling of immense space. Sliding glass doors disappear into the walls to create wide open spaces to the lounging patios, pool deck and lawn on the main level and large suite balconies on the second level. The exterior living space has quality hardwood furniture available everywhere.. The interior furniture is fully complimented by eclectic collections of antiques and original artworks of excellent quality. The main floor has a full living room, dining room and a large fully equipped chef’s kitchen constructed with hardwood cabinetry and granite.. 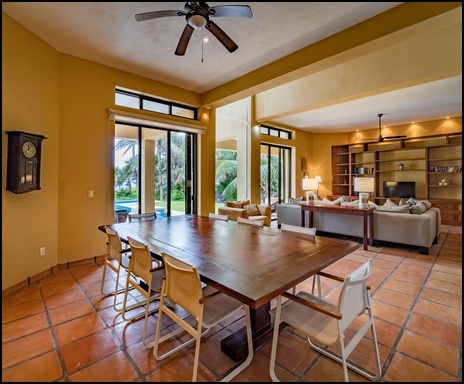 Adjacent to the kitchen is a large outdoor dining table and entertainment area, which is an ideal setting for eating and socializing, while admiring pool and ocean views. 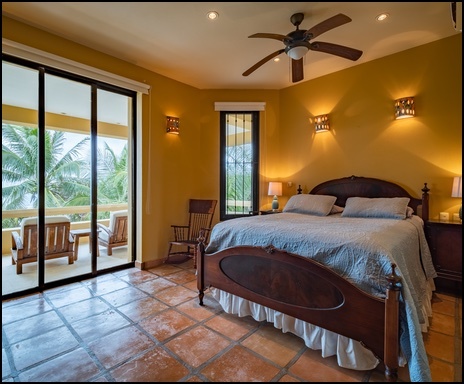 Though there are bedrooms throughout Casa Kukulcan in the upper and lower levels, the main living area has one full suite with full bath which can be used as a study also. 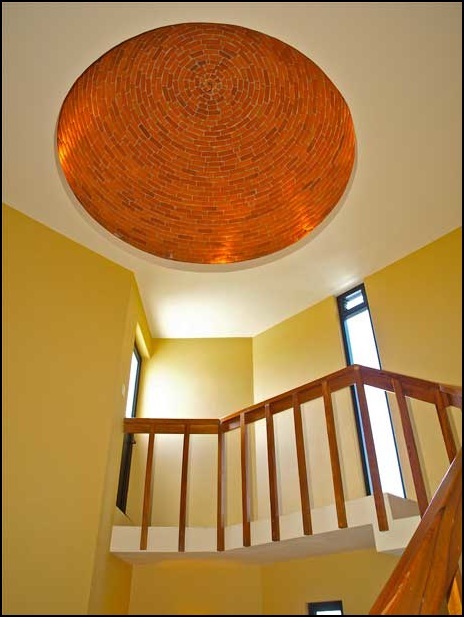 Ceilings soar at the portal window and vaulted ceiling to 20 feet while the view to the roof exit crowned by a handmade brick dome, is 35 feet high. 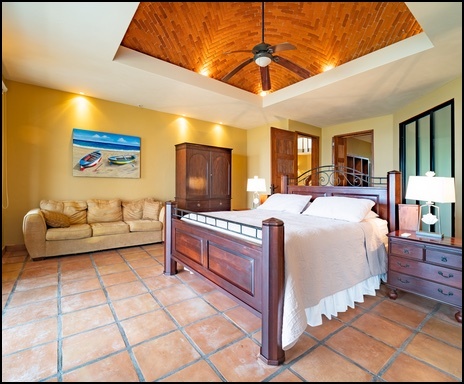 There are 4 suites and 2 other bedrooms with baths and air conditioning, which sleep up to 16 guests. The main master suite is huge with Jacuzzi tub and double showers. 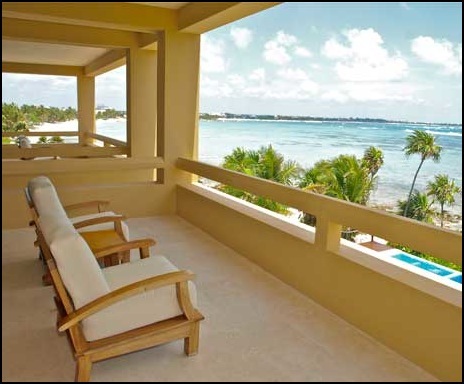 Suites have ocean and jungle (sunrise and sunset) views with access to broad balconies and verandahs. 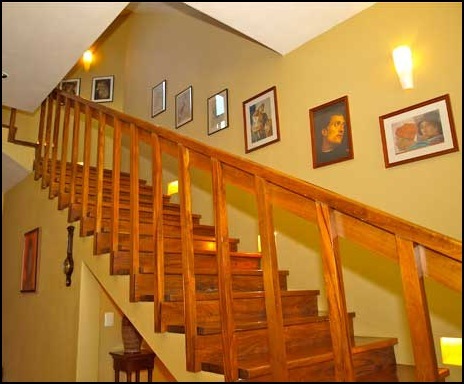 Three of the four suites are located on the third level reached by an imposing solid hardwood staircase. 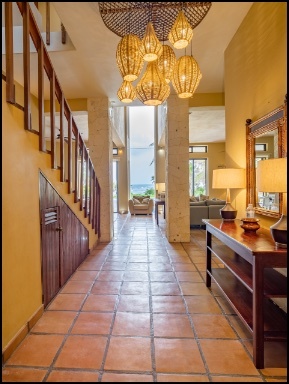 At the top is a very large landing with beautiful views through the window portal and vaulted ceiling to the pool and ocean. The master bedroom suite is 700 sq ft of opulence. It includes a relaxation area, treadmill, double shower and ocean view tub. 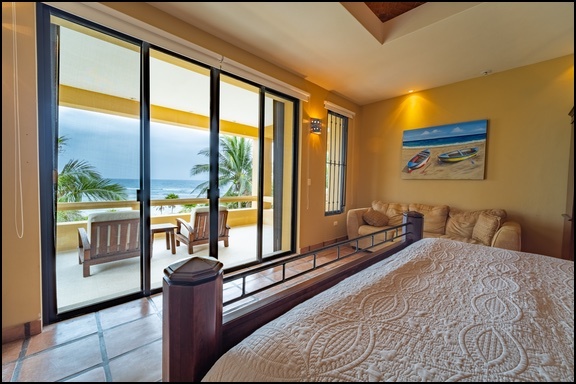 The king size bed is positioned in the center of the room facing the ocean with windows allowing for multiple views. The second and third bedrooms on this floor share a huge relaxation balcony. 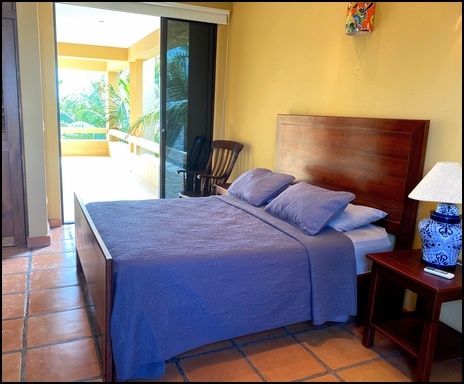 All bedrooms are fully air conditioned and also allow for flow through of cool sea breezes. Vanity blinds (lowered from the top) allow for showering and changing privacy while keeping views at eye level. The large roof area has a built in bed space and hammocks can be slung under a thatched palapa to catch the cool night breezes and allow for amazing stargazing. 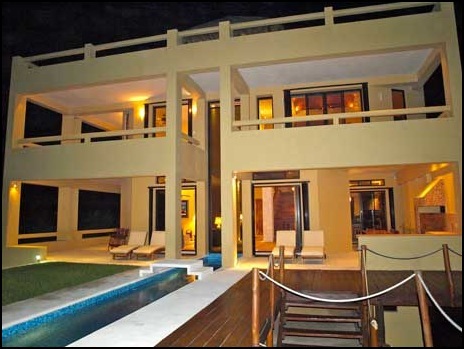 Casa Kukulcan is located about 50 minutes south of Cancun airport and about a mile south of Akumal village. This area of the Riviera Maya has many half moon bays that have beautiful lagoons and close reefs that are ideal for snorkeling. 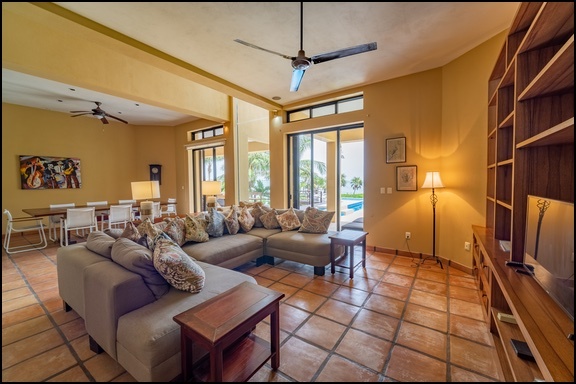 There is a small sandy beach directly in front of the house with direct access to the lagoon and reef and a much larger private beach with full access 100 yards away along a sandy walk. 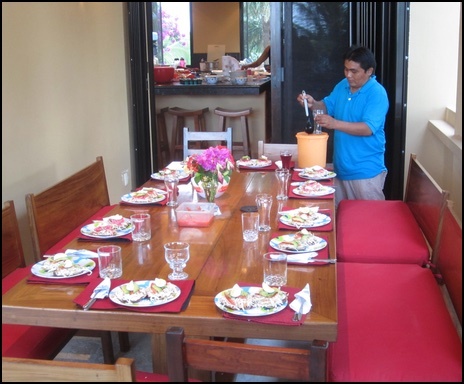 The villa staff is there daily to take care of your needs. Our personal concierge services will arrange for Chef prepared meals, professional massages, tour operators, private yoga instruction, fishing, diving and golf - all with nominal service charges. Kayaking and sailing activities are available in the lagoon. Many other activities are within easy reach including the not-to-be-missed Mayan ruins, as well as the cave and underground river systems. 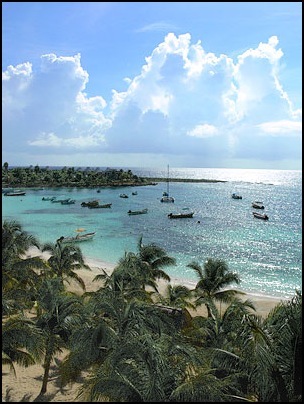 The Riviera Maya of Mexico begins south of Cancun and stretches down to Tulum. 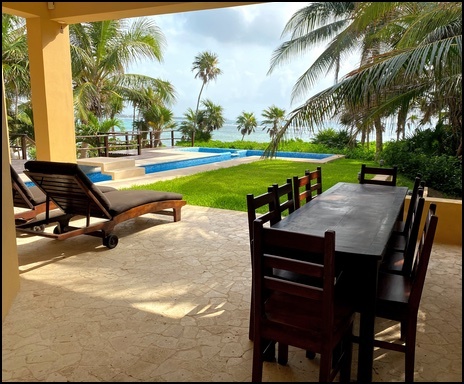 Casa Kukulcan is located just south of the quiet relaxing village of Akumal, which is centrally located between Playa del Carmen and Tulum. To see Drone video and GoPro video footage of Casa Kukulcan, click the video icons below. 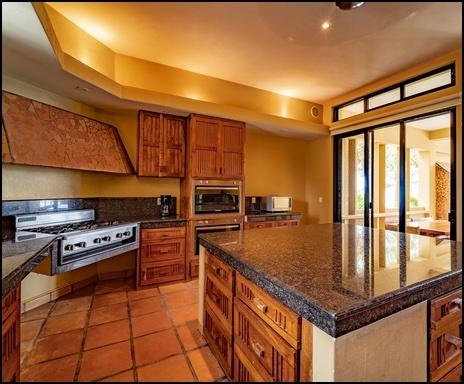 To see more photos of Casa Kukulcan, click the box below. Download supplemental materials, including testimonials, bedroom usage, beach access information, driving directions, tips, and recommendations. Files will download as one compressed .zip file. View the supplemental files in your browser in a new window. Access supplemental materials, including testimonials, bedroom usage, beach access information, driving directions, tips, and recommendations. View the supplemental files in your browser in a new window. If you would like to download the files, you can download them to your Dropbox account. You can also create a new free account. 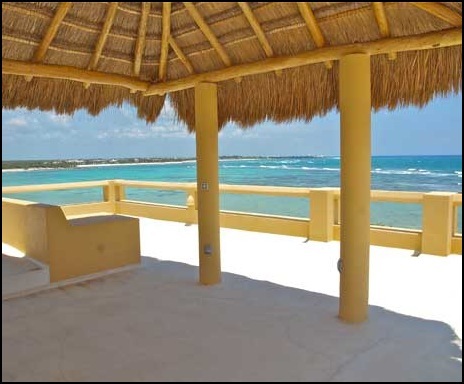 Casa Kukulcan is available for rental or sale. Please contact us with any inquiries. Send us an email, or click below to call us by phone or Skype. If you do not receive a confirmation email, please manually email us at the email address above.